The pleurae refer to the serous membranes that line the lungs and thoracic cavity. They permit efficient and effortless respiration. This article will outline the structure and function of the pleurae, as well as considering the clinical correlations. There are two pleurae in the body – one covering each lung. They consist of a serous membrane – a layer of simple squamous cells, supported by connective tissue. This simple squamous epithelial layer is also known as the mesothelium. Visceral pleura – covers the lungs. Parietal pleura – covers the internal surface of the thoracic cavity. These two parts are continuous with each other at the hilum of each lung. There is a potential space between the viscera and parietal pleura, known as the pleural cavity. We shall now consider the structures of the pleurae in more detail. Fig 1.1 – The parts of the parietal pleurae. Mediastinal pleura – Covers the lateral aspect of the mediastinum (the central component of the thoracic cavity, containing a number of organ). Cervical pleura – Lines the extension of the pleural cavity into the neck. Costal pleura – Covers the inner aspect of the ribs, costal cartilages, and intercostal muscles. 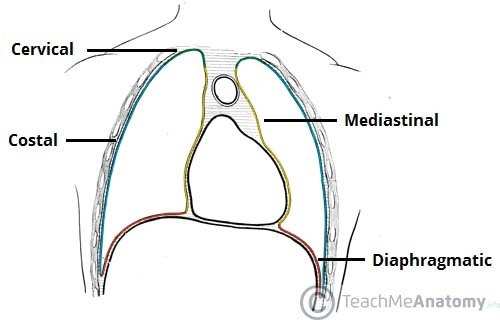 Diaphragmatic pleura – Covers the thoracic (superior) surface of the diaphragm. The visceral pleura covers the outer surface of the lungs, and extends into the interlobar fissures. It is continuous with the parietal pleura at the hilum of each lung (this is where structures enter and leave the lung). 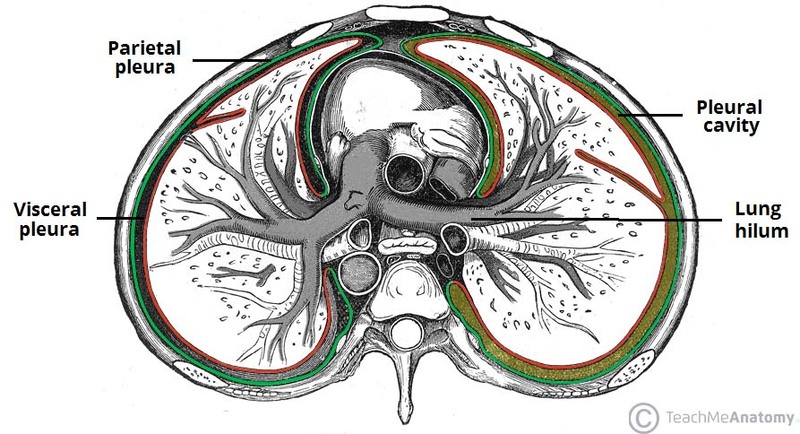 The pleural cavity is a potential space between the parietal and visceral pleura. It contains a small volume of serous fluid, which has two major functions. It lubricates the surfaces of the pleurae, allowing them to slide over each other. The serous fluid also produces a surface tension, pulling the parietal and visceral pleura together. 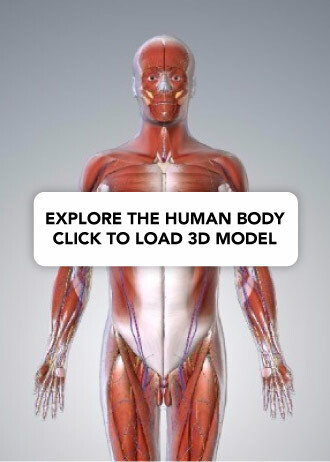 This ensures that when the thorax expands, the lung also expands, filling with air. Fig 1.1 – The parietal and viscera pleura, and the pleural cavity. Note how the two layers of pleura are continuous at the hilum of the lung. Anteriorly and posteroinferiorly, the pleural cavity is not completely filled by the lungs. This gives rise to recesses – where the opposing surfaces of the parietal pleura touch. Costodiaphragmatic – located between the costal pleurae and the diaphragmatic pleura. Costomediastinal – located between the costal pleurae and the mediastinal pleurae, behind the sternum. These recesses are of clinical importance, as they provide a location where fluid can collect (such as in a pleural effusion). The parietal pleura is sensitive to pressure, pain, and temperature. It produces a well localised pain, and is innervated by the phrenic and intercostal nerves. The blood supply is derived from the intercostal arteries. The visceral pleura is not sensitive to pain, temperature or touch. Its sensory fibres only detect stretch. It also receives autonomic innervation from the pulmonary plexus (a network of nerves derived from the sympathetic trunk and vagus nerve). Arterial supply is via the bronchial arteries (branches of the descending aorta), which also supply the parenchyma of the lungs. A pneumothorax (commonly referred to a collapsed lung) occurs when air or gas is present within the pleural space. This removes the surface tension of the serous fluid present in the space, reducing lung extension. Fig 1.2 – Radiographic appearance of a left pneumothorax. Clinical features include chest pain, and shortness of breath, and asymmetrical chest expansion. 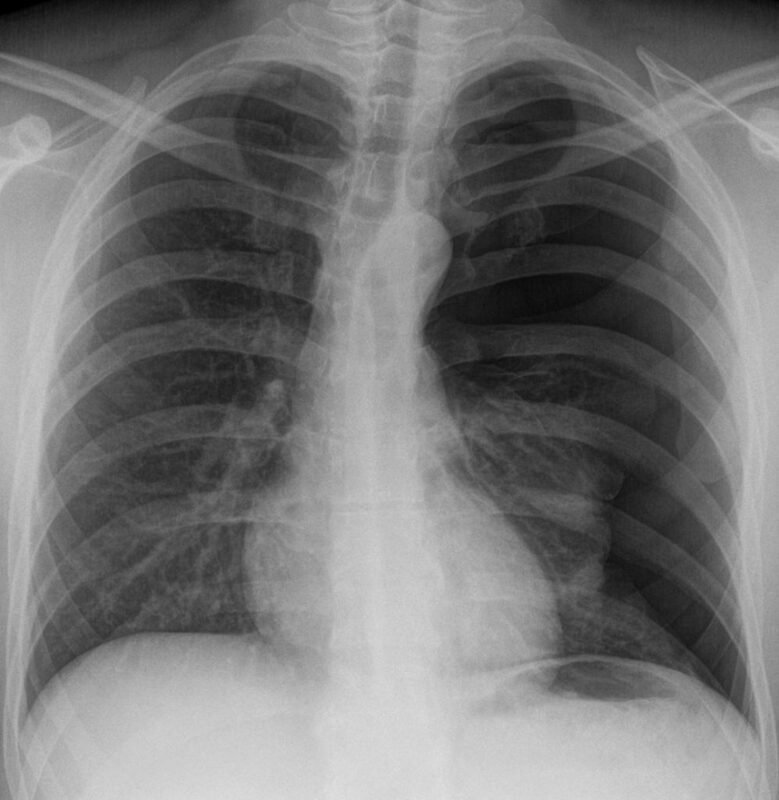 Upon percussion, the affected side may be hyper-resonant (due to excess air within the chest). There are two main classes of pneumothorax – spontaneous and traumatic. Spontaneous: A spontaneous pneumothorax occurs without a specific cause. It is sub-divided into primary (no underlying respiratory disease) and secondary (underlying respiratory disease present). Traumatic: A traumatic pneumothorax occurs as a result of blunt or penetrating chest trauma, such as a rib fracture (often seen in road traffic collisions). Treatment depends on identifying the underlying cause. Primary pneumothoraces tend to be small and generally require minimal intervention, whereas secondary and traumatic pneumothoraces may require decompression to remove the extra air/gas in order for the lung to reinflate (this is achieved via the insertion of a chest drain). The pleural membranes are comprised of what type of epithelium? Air inside the pleura describes what condition? Visceral pleura is sensitive to which of the following?